David Slater was born in the Leicestershire village of Medbourne in 1849 and possibly after having completed an apprenticeship moved to Newark Nottinghamshire somewhere around 1868. He took a job as a coachbuilder for Castle & Sons in Lombard Street. At this period of his life he had only a slight knowledge of fishing but such was the local interest that he would have known someone who was a fisherman and he in turn soon took up the sport. As a Coach maker he would certainly have had the necessary skills to work with wood and in 1869 produced his first fishing rod, a six-piece pocket roach rod. He quickly gained a reputation for making fine rods and established his own business as a Fishing Tackle Maker at 9 Portland Street, Newark. In 1881 he started making reels and on 22nd May 1883 he was granted patent No 2551 for his world famous annular line guard. This concept was a genuine piece of inventiveness that is still in use today. 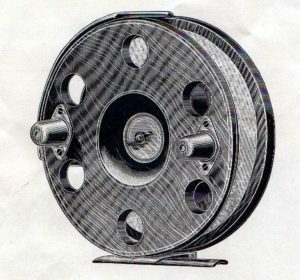 The reel was called the Perfect Combination Reel, many people assume that this is due to the fact that there is a combination of materials. This is not so, it was due to the fact that a combination of different styles of fishing could be carried out using the reel. Many people try and look up the patent number stamped on the back of the reel and have no success. The reason is that it is not the patent number but possibly a production number. These numbers go into the 4,000’s. In October 1888 another patent was granted, this time in conjunction with Arthur Thomas Allcock a Newark engineer. This was a follow up to a previous patent of February 25th 1885 and again it was for an idea that is still in use today — the collapsible landing net. Expansion of the business was achieved by attending exhibitions and advertising in the angling press. The main media for his advertising was in the Fishing Gazette with an advert being place almost every week. Each newly introduced reel or rod was duly launched in the press or at an exhibition. The business did expand and, somewhere along the way, David Slater became David Slater & Co. That is until 1895 when the business of David Slater & Co. was offered for sale in the Fishing Gazette of June 29th. On 31st August 1895 another special notice in the Fishing Gazette announced that the business revert to being known as David Slater and not David Slater & Co. The Future sea reel available in sizes from 5 to 8 inches. 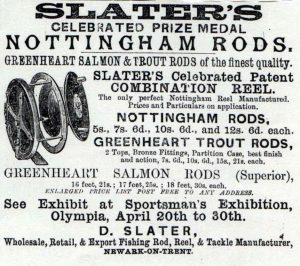 Throughout his life he was a well-known attendee at the various fishing tackle exhibitions and gained many prize medals, the first being at Norwich in 1881. 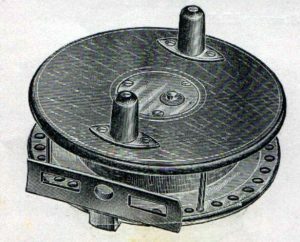 The patent combination reel was such a success that Salter even offered to fit the annular line guard to other reels for five shillings. This explains why we see non-Slater reels with annular line guards. Again somewhere along the line the business was sold to Charles Smith, the Newark gun maker, with David Slater taking on what we would now call a consultancy role. On 22nd July 1917 David Slater died, his obituary in the Fishing Gazette reflected the times. A rather flimsy copy, due to war shortages and a lack of people at the funeral. This was probably due to the numbers that had either died during the war or were still away fighting it. The company continued to make fishing tackle, but eventually was sold to the Millward Company. They in turn made rods and reels in Newark until some point during the Second World War when the factories were finally closed. It has been impossible to find out exactly when, as the records for the period have all gone and people I have interviewed could not put an exact date on it. David Slater followed a similar route to market as the Hardy Brothers, plenty of adverts in the Fishing Gazette, attendance at exhibitions, endorsement by leading anglers and participation in competitions. All resulting in the public becoming more aware of the product. The difference was that Slater had no family members to take up the business and he also had a thriving wholesale side. He certainly made reels for numerous tackle companies including, Hardy, Farlow, Carter, Millward, Bartleet, Bernard, Allcock, Hatton and many more. He also had a very active export business with one section in his 1911 catalogue exclusively dedicated to New Zealand. Other than the Combination reel he also made the Fly Fishers Winch, a reel that was sold by many tackle companies. 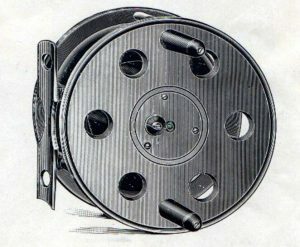 This reel was introduced around 1890 and continued to be sold for more than twenty years. If one style of reel made Slater stand out more than any other maker it was the centrepin. His mastery of making these types of reels drew Walter Dingley to Newark to work for him. Later he would leave for Alnwick and the Hardy Brothers, taking with him the skills that he had acquired at Slater’s. 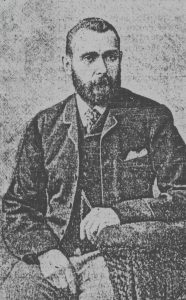 He in turn, having worked for Rueben Heaton, would have imparted his brass reel making skills to the other members of the Slater work force. The number and type of reels that Slater made still continues to amaze me with new variations turning up every year. The common ones are the Future sea reel, the Ideal centrepin reel fitted with annular line guard in alloy, the Zephyr and the variations including the Wallis Zephyr, the SEJ winch and the Patent Combination reel. Of all his reels, as far as I am aware, only two have the model name stamped on them; the Wallis Zephyr and the SEJ fly fishers winch. Most reels tend to have nothing on them — not even a makers name. Some do have the Slater oval logo on them, but a word of warning here I have seen attempts to copy this. One reel recently turned up at auction and it was a Slater reel. From first glance it looked like it was also stamped but a small alarm bell started ringing. When a magnifying glass was used to look at the logo it was obvious that this had been engraved. Slater certainly did not invent, design or patent this idea. It is more than likely that it was Rueben Heaton who did so. 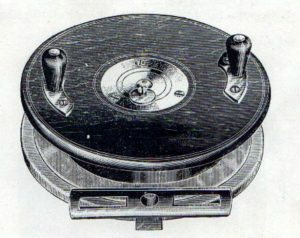 It is shown in the Reuben Heaton catalogue of 1877 as a spring centre four years before David Slater started making reels. So who coined the phase? We have to put the blame on the writer J.H.Keene, who in his book “Fishing Tackle” published in 1898 unknowingly credited Slater with the invention. Slater certainly put it to better use than any other maker, maybe the phrase ought to be “fitted with a latch that Slater certainly should have invented”. I am still researching Slater and the Nottingham fishermen and any further information would be appreciated. This entry was posted in Antique Tackle Observer, David Slater. Bookmark the permalink. Hello. Thank you for your nice imformative article. I have two “D Slater, Newark”. fly rods, wich were left to me. I have often thought to look up any info on him, and consequently have found your notes. Thank you, really interesting. 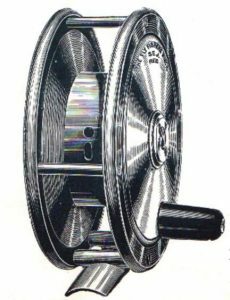 I googled David Slater reels today & came across this article – interestingly the picture of the Wallace Zephyr says that it was only available in 4.5″ diameter- I happen to have a Wallace Zephyr which is 4.25 ” in diameter. 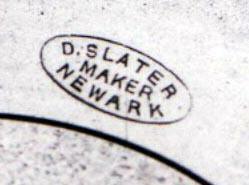 It has the correct D Slater maker Newark oval logo & the Wallace Zephyr stamped on it. I have owned it for 40 years & believe it to be genuine. I would be greatful for any information you have on this model. Hi there Alec, you are indeed correct there are 5 versions of the Zephyr in 3.5 4 4.5 and 4.25. There is also a sea version but I do not have that catalogue listing to hand. I have about 10 versions all slightly different and we are still finding out more about them. I have been trying to put a date on a rod I have D Slater, Maker, Newark on reel seat. I can see many rods whilst searching D Slater on Google search engines that have cork handles but none have a leather handle similar to my own. This is not something I’m looking to value but would really appreciate getting to know some of the history behind it as I have a few vintage rods from Hardy and Allcock but none have a leather grip. Can any of you point me in the right direction of web sites you’ve visited on your travels that would be of any use. Also Stef how is the book coming on, it would be great to have a further read on the topic.